We will start the day with breakfast at 9:00 am, an Easter Egg Hunt for the children at 9:30 and a special celebration of our Lord’s resurrection at 10. We would be honored to have you with us! Our children and teens are preparing to participate in the Regional LTC program. Song Leading, Scrap books, puppet shows and more. It is a fun way for our children to learn how to serve God. If you would like to learn more and have your child participate, call the church office for more information. Join us in a day celebrating our High School Seniors’ Graduation. We will have a presentation of the Seniors during Worship, and dinner to follow. 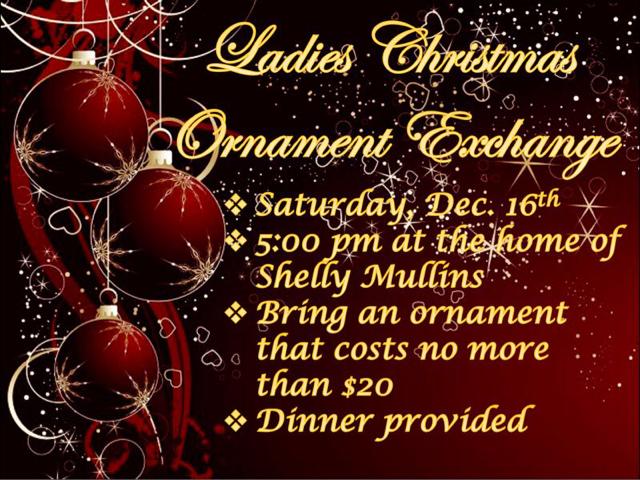 For more information on being a part of this event, contact our church office. We will be taking a van to Saturn Road Church, Feb.16-17 to hear Ray Vander Laan present this study. To register, go to http://Www.saturnroad.org . For more information on transportation, contact Geron or Kenrie Bryan. Let’s Celebrate the New Year as a family! Bring your games and join us for a game night. The teens will be spending the night with a lock in. 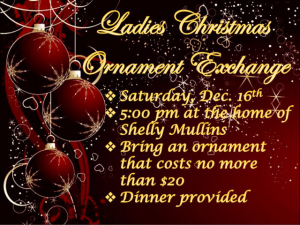 All Ladies are invited to an ornament exchange, Dec. 16th at 5 pm at the home of Shelly Mullins. Our Church family will be having it’s annual Christmas meal on Sunday, December 10th immediately following services. Everyone is invited!